This is the “baby Buick” that will make its world debut at the upcoming Detroit Auto Show. Verano, as it is called, is a “compact sedan” (in US terms of course) based on General Motors’ Delta II platform that also underpins the Opel Astra and Chevrolet Cruze. Seen it before? 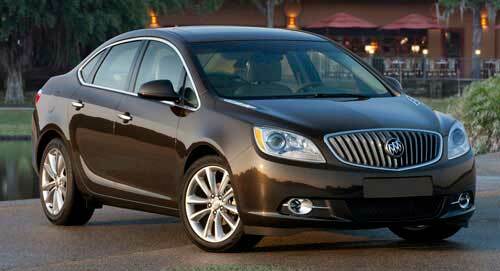 The Verano was launched in China mid-2010 as the Buick Excelle GT, and we showed you that car here. The Verano, which sits below the Regal in Buick’s range, will come with an Ecotec 2.4L engine paired to a six-speed automatic gearbox. With 177 horsepower and 230 Nm of torque, the Verano does 0-60 mph (0-96 km/h) in 8.0 seconds flat, and is capable of 11 km/l on the highway. That will be the sole powertrain option when it goes on sale in the fourth quarter of 2011, but a 2.0L turbo engine will be offered in the future. In contrast, China’s Excelle GT comes with a 1.6 turbo with 181 hp/235 Nm. Buick is all about traditional comfort and luxury, so the Verano is claimed to be “the quietest compact sedan on the road, quieter than many midsize and full-size cars”. Among the unique measures to maintain a “library-quiet driving experience” are hydraulic ride bushings, isolated engine cradle, nylon baffles and foam in hollow body portions, five layer headliner, triple-sealed doors with fiberglass “blankets” and acoustical laminated glass, among other things. Even the 17-inch aluminum wheels are manufactured in a unique way to enhance quietness, Buick says. Meanwhile, the Verano’s cabin features “exceptional seat comfort”, soft touch materials and ambient lighting inspired by the LaCrosse. It also comes with the same grade of leather as the LaCrosse that can be had in a special “Choccachino” colour seen here. Buick says that the components within the center stack have a gap tolerance of less than 1 mm, while the instrument panel-to-door panel gaps are less than 5 mm – the best in class. Besides the expected Bose stereo, OnStar and 10 airbags, the Verano’s heated steering wheel and seats automatically activate when one starts the car in temperatures below 7 degrees C, surely something many Americans facing a harsh winter would appreciate.